As technology continually moves forward, and there’s an APP for everything, it strikes me that human interaction can sometimes be replaced. This is not always for the best. In the Hospitality business, I have mixed feelings. True Hospitality is at the very core of what we do, and I am an absolute believer in what I call “paramount service”. In many cases and in many of our first-hand experiences, its evident that true hospitality is being lost. Decades ago, hospitality was experienced everywhere from the gas station to the dry cleaner to restaurants, regardless of price point. I am also a huge believer in the fundamentals. Hands-on understanding and execution of all aspects of running a hospitality operation by the both the owner and management team. I’m talking about the foundational basics of Finance, Marketing and of course Staff Training and ultimate Service delivery. It's perfectly fine to automate your business and use technology and systems to improve, but not at the expense of understanding the core elements of your business first. So it seemed on a recent trip to Florida last week. After several days of experiencing paramount service at the Diplomat Beach Resort, my initial judgement got the better of me as I was suddenly immersed in technology at an airport. 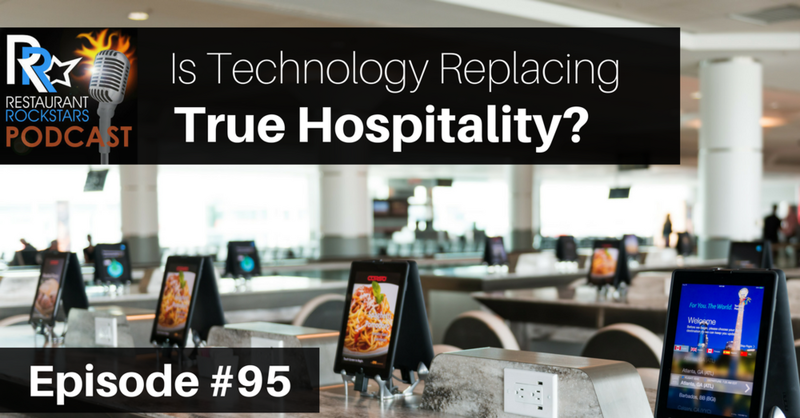 Listen to today’s episode and see for yourself if true Hospitality is being replaced by Technology. Hey guys, Roger here! Recently, I've come to the conclusion that much of the service has been lost in a service business. I'm reminded of what service meant decades ago before technology took over. At the service station, your windshield was washed, oil was checked under the hood and you sat in your car while gas was pumped for you, it was called the service station for a reason. Now, it's a convenience store with gas pumps and you're on your own; in restaurants, the maître d' greeted every customer at the door as if they were an old friend. They took your coat, brought you to a nice table and pulled the chair out for the lady. Today at many restaurants, more than likely, you're not made to feel special; you're just the next customer. Unfortunately, those by-gone times and service philosophies have all but disappeared, or have they? Welcome back RockStars! Today I'm asking “Is technology taking service out of a service business?” I recently had the opportunity to speak at a Performance Food Services Event in Florida. Great people, great products, fantastic event, I'm speaking from experience as a former 20-year customer. The event was held at the famous Diplomat Beach Resort which is recently undergoing an extensive make over to return it not only to its former glory, but to bring it well into the future. A large property that now feels like a hip urban up to the minute boutique hotel. Throughout, the property hospitality was clearly evident, beginning with the valet as I drove up to the grand entrance and carried forth to the front desk Bellman, Housekeepers, Pool and Beach crew to the service team that took care of the extensive daily activities of our large group which occupied well over five hundred plus rooms for several days. This was truly personal service, no matter how small the detail or where, I was amazed at the attention I received across the property. My fellow colleagues and attendees shared similar experiences and nothing but accolades for this obviously well-trained and gracious Staff; much like restaurants hotels are of course a service business and one should expect nothing less. Keep service in mind as this now brings me to the airport in Minneapolis St. Paul. After entering the terminal I saw a sea of iPads, portable kiosks for several restaurants and bars both in the restaurants themselves and at all common seating areas at many of the gates. It was time for dinner and I sat at a table and placed my order for an Caprese Salad with heirloom tomatoes and freshly grated Parmesan accompanied by a nice glass of Merlot. All from the comfort of my seat from a touchscreen, the order process concluded with payment and an opportunity to leave a gratuity. Without giving further thought, I left my standard 20% tip and completed the order in an instant. I suddenly started re-thinking the transaction questioning in my mind why I left a reasonable tip when much of the traditional interaction with the service staff was now missing. After twenty plus years in the restaurant and hospitality business and exemplary service being a point of pride with me, I was re-thinking this entire experience as a handheld touchscreen device now replaced much of my service expectation. Now here's a paradigm shift, much like the 2017 Super bowl where I let my imagination and better judgment get the better of me in advance of the outcome, I was not only completely mistaken but quite surprised as a personable attentive and highly efficient server took care of my every need including keeping my water glass filled, inquiring if the wine was to my satisfaction, and keeping me apprised as to the timing of my salad. Despite my misjudgment, technology did not replace true hospitality and this server earned her a well-deserved 20%. So truth be known, the true concept of hospitality is in fact alive and well, it simply needs to be embraced, shared, and practiced daily with your entire team both front and back of house. Thanks for listening to The Restaurant's Rockstars Podcast. For lots of great resources head over to restaurantrockstars.com and while you're there, download a copy of the book, ‘Rock Your Restaurant’ it’s a game changer, See you next time!